The end of our dry period is around 24 hours away. We have talked about this storm for a few weeks now and it is shaping up to be a very active 4-day weather event. We are now looking at 4-5 inches of liquid for the Carson Range, while the western side of the lake, in the High Sierra could be looking at 7-8 inches of liquid. 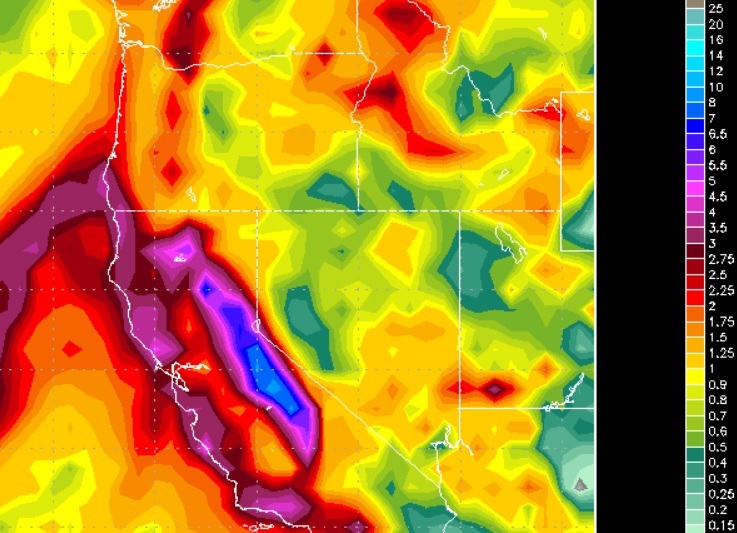 Areas down around Mammoth could see up to 10 inches of liquid precip. We have bumped up our Carson Range precip totals to 2-5 feet of snow. We are leaning in the 40 inch range, but that could go higher or lower. As far as elevations are concerned, we believe this will be all snow for Mt. Rose. The leading edge of very warm air will see snow levels in the 7,000 foot range, but those will quickly fall all the way down to 4,000 feet by Sunday night. This will be very beneficial for all Tahoe Resorts! The peak of the precip should be all day Saturday. Then a very short break and starting up again Sunday afternoon and lasting through Monday. High pressure moves in after this storm exits the area. The next storm cycle could show up around the 11th or 12th of February as our ridge gets kicked back out to sea.